Or, get it for 9200 Kobo Super Points! 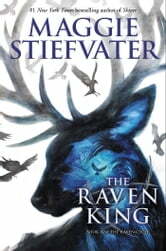 Im always put off by final books in series, especially favourites like Raven Cycle. But I trust Steifvater and she delivered big time. I loved the climax of twisting stories and the magic of the world. Absolutely brilliant book. Wonderful Conclusion to a FANTASTIC Series! I really enjoyed this one and it was a satisfying conclusion to one of my all-time favourite series. However, I had a couple issues with that that were more about sub-plots and side characters than anything else. Also, THE SCORPIO RACES is still Maggie's best book, just saying. One of the hardest things for me to come to terms with when I finished this one was that it was over. I wouldn't have a chance to be with these characters anymore. I was really satisfied with how our five main characters stories played out. I think Ronan had the strongest character and character arc throughout this entire series and I was really pleased with his conclusion. I liked that he became ... more Ronan? I don't know how to describe it. It's almost as though he was a fake version of himself in hiding until this book. I think Stiefvater's books are very heavily character driven, though, and that is also where the downfall of this book was for me. The secondary characters were extremely lacking this time around. It also makes me question just how relevant and important some of them were previously, such as Greenmantle in BLUE LILY, LILY BLUE, to the point that I feel I could have done without as much screentime for them in the series in general. I think Piper was such a weak character and her whole arc from the first time she was introduced just feels a bit pointless now that I have finished the whole story. I also feel like this about Henry Cheng. I feel like he was thrown into the mix and Stiefvater was like "LOVE HIM" but I just couldn't get there. I didn't see the appeal. Considering how heavily he was pushed on us in the last book -- and in Stiefvater's Recaptains post for BL,LB -- I just anticipated more from him. Not a weird love sick puppy crush on Gansey and a need to be in the inner circle. He felt like a weird fanservice for the reader to feel like THEY could be part of the story if they had the Right Stuff™ and could make Gansey Excited™. It was just weird to me and I couldn't connect to him and he ended up playing a semi big role and it just felt forced. *sighs* As well, I did not like Artemus. He was such a useless character tbh. And so blah too when he finally did do some talking. I feel like all the good stuff was put into Mr. Gray and his character and so Artemus was hung out to dry. But the plot! I loved the plot! The magic! The intrigue! I think it wrapped up so nicely and I was really impressed with how Stiefvater did it. I was a little hesitant and skeptical going into THE RAVEN KING because how could anything live up to anyone's expectations but plotwise I was really impressed. All the loose ends and threads were neatly tied in a way that served the purpose of the story but also told the right story. I feel like you'll have to read it to understand what I mean by that. Stiefvater's writing, as always, is flawless. The pacing was done really well because it gave us time to have a build up to the final arc but it also didn't drag. I took my time reading this one but it still had me turning pages and wondering what was going to happen next. I liked the inclusion of the little "happy" moments because that's how life is. I also really liked that the ending was hectic and fast but didn't feel rushed. Everything and everyone got their due diligence. Do I recommend this series? Yes. 100% yes. The fantasy, the magic, the characters, the kisses, all of it was fantastic. The Raven Cycle will forever be one of my favourite series and one that I am sure with each reread will bring me new pleasure -- and pain. This was the perfect finish to my favourite series to-date. I am going to miss Blue and her(my) Raven Boys. I love them all but especially Ronan and Adam. I disagreed with how certain character arcs unfolded and I felt a lot of parts were unnecessary, while at the same time plot points I felt were imortant were left uderdeveloped. My general impression was that the author got tired of this sort of story and tried to turn it into another thing entirely in the last book. However, given how great this series was - especially for ya standards - it just means I'll give 4 stars instead of 5. I'll remember these characters forever.